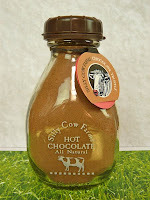 Today was Day #5 of Chocolate Cow Theme Week. 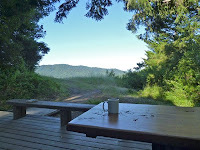 The location where I sample a chocolate can often be as an enjoyable as the chocolate itself. 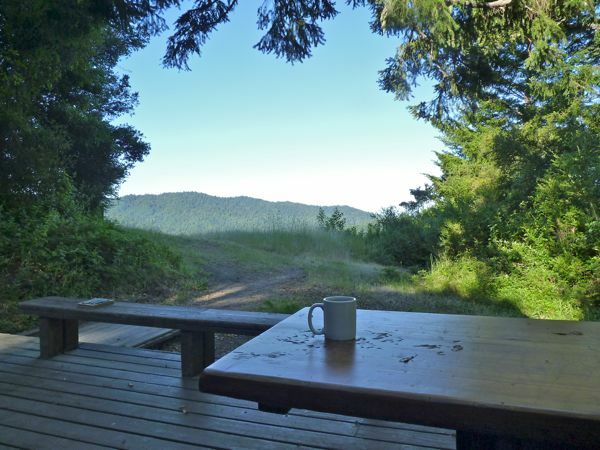 For example, this morning I was sipping this Silly Cow Farms hot chocolate mix (that came packaged in a glass milk bottle) at a Hiker's Hut in the coastal mountains of Northern California, with a gorgeous view. This Silly Cow Farms hot chocolate mix was made by Bread and Chocolate, Inc. (Wells River, VT), also known as Burnham and Mills (after two outlaws from the past). The couple who founded this company live in a home that apparently housed a jail in the late 1700s; and Burnham and Mills may have stayed there. It's nice to have a colorful story to go along with you morning cup of chocolate.